The residential heat pump range was developed to integrate with any existing residential hot water geyser in the South African market. Our energy efficient residential heat pump range can, therefore, be installed without any expensive replacement costs or changes to the existing hot water system. The residential heat pump range was developed to integrate with any existing residential hot water geyser in the South African market. Our energy efficient residential heat pump range can therefore be installed without and expensive replacement costs or changes to the existing hot water system. There’s a residential heat pump in our range that will fit the shape and size of your home’s hot water requirements. There are three different sizes of heat pumps available with the 3kW and 5kW heat pump is also available in a UV protected polymer casing for coastal conditions. 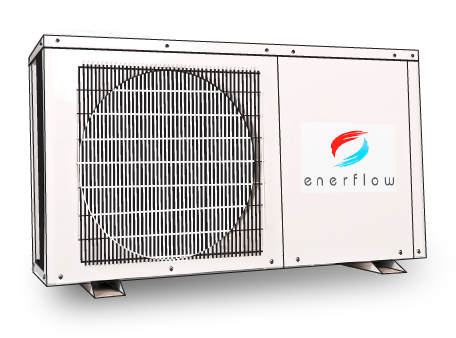 If you are looking for a residential heat pump that saves you money and that is easy to install and operate, then our range of Enerflow residential heat pumps are ideally suited to your needs. The Enerflow range has been proven to be and efficient and reliable means of heating water in households for many years. The units are equipped with an easy to operate intelligent LCD control panel that can be located inside the house or at the heat pump itself. We use the latest technology to ensure optimal efficient and energy saving. Built-in manual changeover switch from heat pump to the electrical backup element should the heat pump be damaged by an electrical spike. Proven track record in South Africa with 1000’s of units installed in all climate regions. Automatically energises the geyser back-up element should something go wrong with the heat pump. Automatic weekly sanitation function inhibits the growth of unwanted Legionella bacteria. Timer function optimises energy efficiency by enabling the user only run the heat pump the warmer periods of the day. * This is done with the aid of the geyser backup element and all control is performed by the intelligent built-in heat pump controller logic (assuming the safety thermostat can be set to 70°C).